This is my '88 Schwinn Le Tour I converted to a 3-speed and a 650B wheel size. 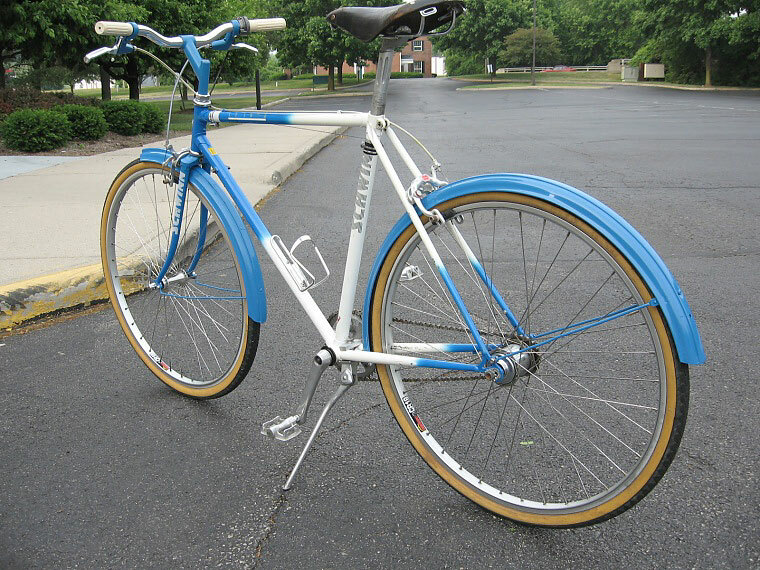 I got this blue and white beauty as a frame and fork in a trade. 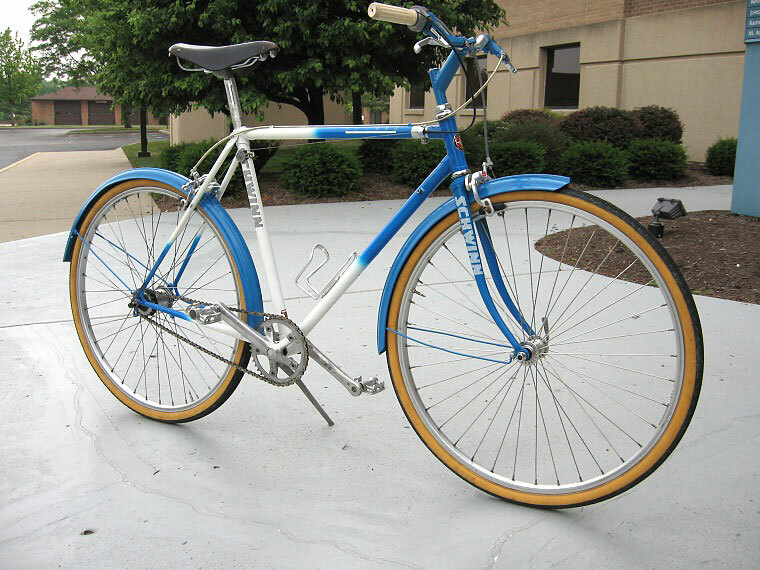 I had a black '91 Schwinn Frontier purpose-built 650B mountain bike with steel rims which I converted to a 3-speed but at 17" the frame size was too small. My friend had this Le Tour that he just wanted to get out of his garage so we traded frames and I swapped over all the components to the Le Tour. At 52cm it's still too small for me as a drop handlebar road bike but it's perfect as a upright bar commuter/touring rig. 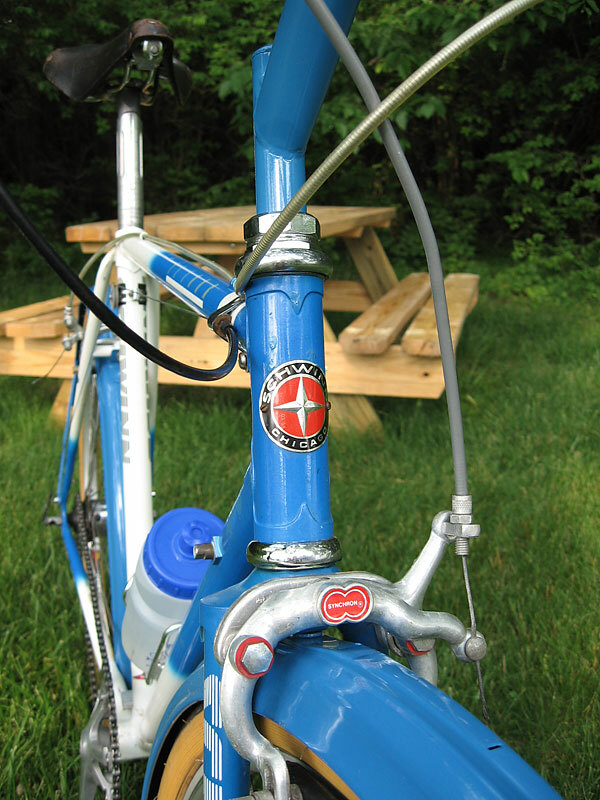 The fenders and the Sturmey-Archer 3-speed are from a '67 C-Itoh (I think) step-through frame 3-speed. 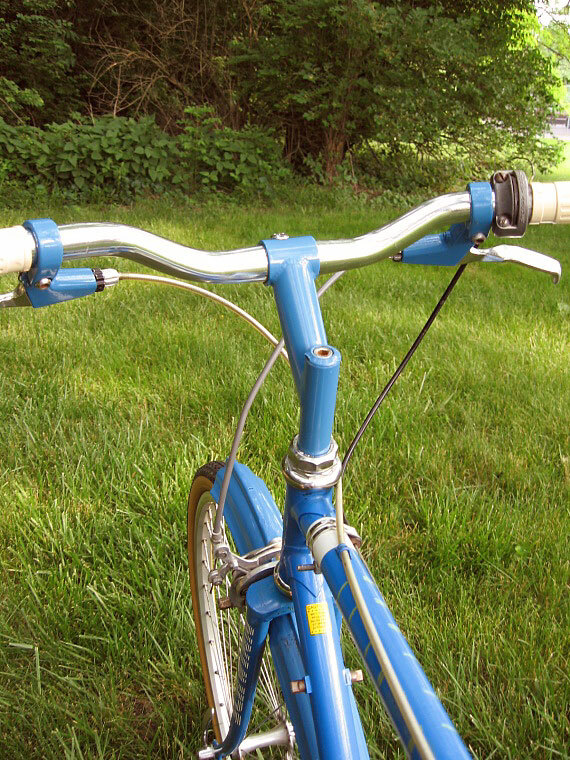 Also the fenders, stem and brake lever bodies I painted blue to match the frame (I mixed the color myself. It's not a perfect match but pretty close). The paint is Sherwin-Williams Industrial Enamel with Mar-Hide enamel hardener and shot with a Binks 2001 spray gun. The frame I touched up as best I can since I didn't want to repaint it and remove all the graphics. 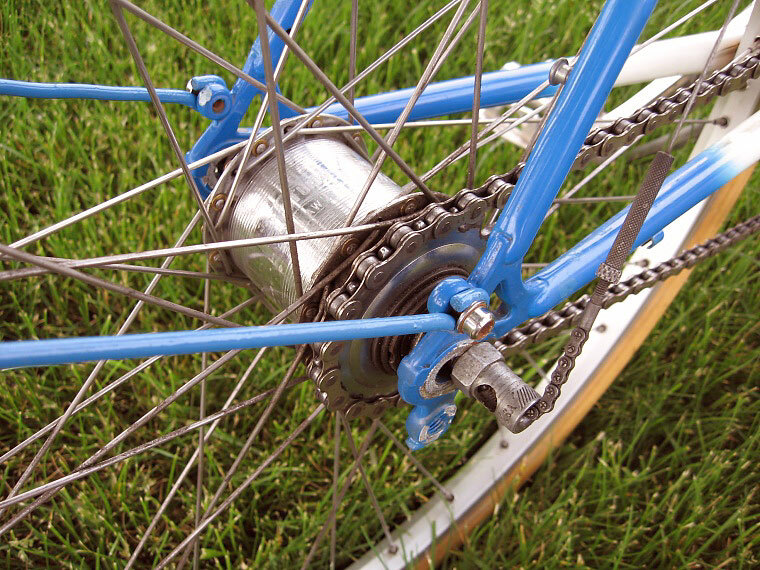 The S-A hub is a '72 unit with a chrome plated 18t cog and the shifting is done with an S-A grip shifter. The shift cable was hopelessly rusted so that had to be replaced. I'm sure it would have been easier to talk Iran into giving up their nuclear ambitions than getting a new correct shift cable for this so I had to rig one from a derailler cable. I had to modify the cable head and a buddy of mine at work welded a tiny piece of bronze to the other end to get the thing to work! I love this bike. Not only is the frame larger and fits me better than the Frontier, at 28lbs it's also three pounds lighter. The Sun CR18 aluminum rims took off at least an additional pound and has better braking. Speaking of brakes they are the early Aultenburger dual-pivot calipers. The front brake works really well but the rear brake is not so good. Saddle is a vintage Brooks B15. I absolutely love 650B. It rides like a Cadillac and it has surprisingly low rolling resistance, even with the inexpensive Kenda tires. It also has a lower center of gravity and just feels more stable. The Sun 650B rims I heard were made slightly too large and the tires were almost impossible to mount so unfortunately this bike will just be for commuting only. I don't want to take a chance getting a flat out in the boonies on a tour (haven't had a flat yet, knock on wood).